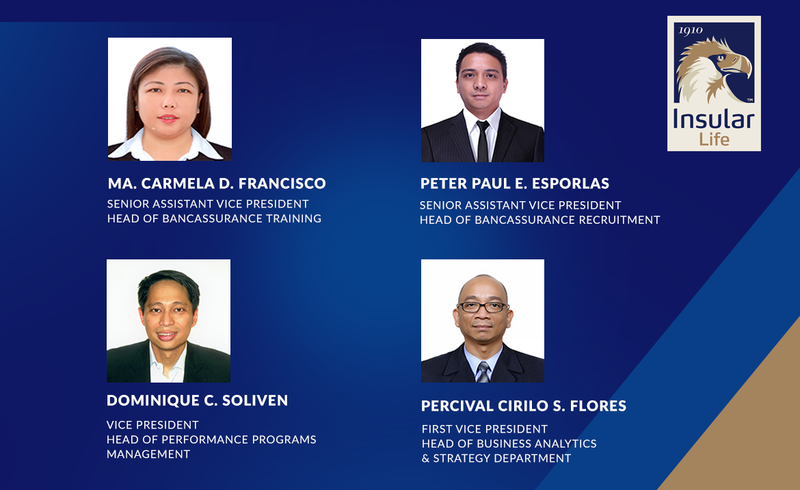 Insular Life announces the appointment of the following officers under its Bancassurance Operations Group: Percival Cirilo S. Flores as First Vice President and Business Analytics and Strategy Management Head, Dominique C. Soliven as Vice President and Performance Programs Management Head, Peter Paul E. Esporlas as Senior Assistant Vice President and Bancassurance Recruitment Head, and Ma. Carmela D. Francisco as Senior Assistant Vice President and Bancassurance Training Head. Flores has extensive experience in the development, implementation, and management of alternative distribution channels, including product development and management, and design and implementation of activity and productivity improvement programs. He was head of the bancassurance and alternative distribution divisions of three different domestic and multinational tie ups. He is a Six Sigma Black Belt professional for operations, process management and improvement. He graduated with a BS in Statistics degree from the University of the Philippines. Soliven’s expertise is in Bancassurance Business Development and Sales Management, which includes developing sales skills forlife and non-life insurance, financial planning, and wealth management. Before joining Insular Life, he held various positions in the Bancassurance operations including people development and sales support of another life insurance company. He obtained his BS Political Science degree and Master’s Degree in Technology Management from the University of the Philippines, and his Master’s Degree in Business Administration from the Ateneo de Manila University . He is a Registered Financial Planner, a Certified Wealth Adviser, and a Certified Trust and Estate Planner. Esporlas has extensive experience in the field of recruitment and selection, recruitment marketing and talent engagement. He was formerly head of the Selection and Placement of another life insurance company. Prior to joining Insular Life, Pipo was the Talent and Acquisition and Data Management Head of Magsaysay People Resources Corporation. He graduated with a BA Communication Arts degree from UP Los Baños. He obtained his MS in Industrial Relations from UP Diliman. Francisco’s expertise is in the field of agency and bancassurance training and development, and sales management in the life insurance industry. She has extensive experience in content and design, training delivery and activation programs. Before joining Insular Life, she was head of Training for another bancassurance venture. She graduated with a BA in History degree from the University of the Philippines and was recognized as a Fellow for Life Management Institute by the Life Office Management Association.